"Together is a beautiful place to be" is really the only thing I can say on what the past 3 months (and a bunch of sleepless nights and very passionate hearts) have meant, but the time has come to announce its debut arriving next month! No more teasers! A collective of over 30+ professional wedding bloggers is about to revolutionize online wedding media, and we're not stopping there! It's going to become the Grand Central Station of wedding inspiration. A gorgeous way to lead couples to the best wedding content that exists online. Brides, grooms, lovers of all things wedding will stay updated on the styles they love most while discovering new ideas along the way! From vintage to modern and everything in between, wedding publishers from around the world have banded together to bring back something special to this community that we all cherish. 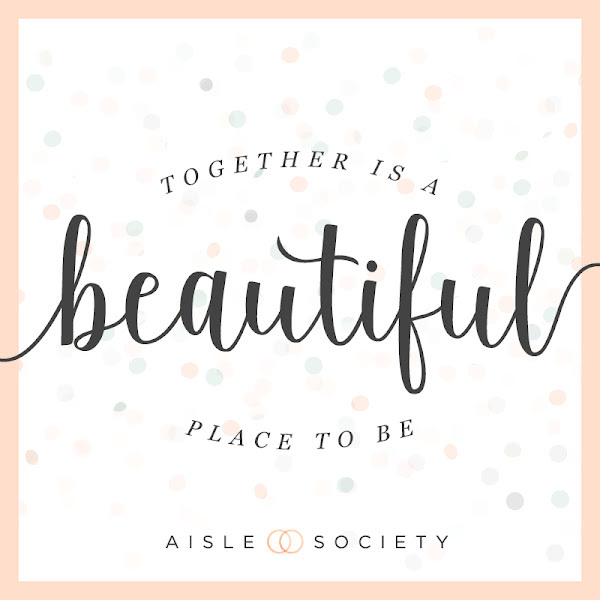 You will definitely want to follow Aisle Society on Instagram, Pinterest, Facebook, and Twitter where you'll soon find out about all the faces (and blogs!) behind Aisle Society. Next stop: NYC for our big launch party during Bridal Fashion Week! And many thanks to Tidewater and Tulle vendor fam Tyler, Martin, and Graham of The Girl Tyler for helping me represent Hampton Roads in one of the clips in the video!